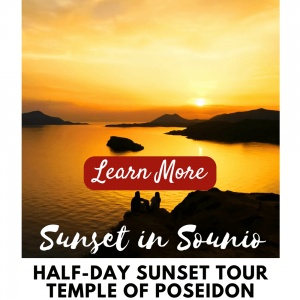 The churches and monasteries throughout Athens and indeed Greece represent an enduring tale of strength and defiance through centuries of crusades and occupation that tightly bound the Orthodox Church and the Hellenic nation together. 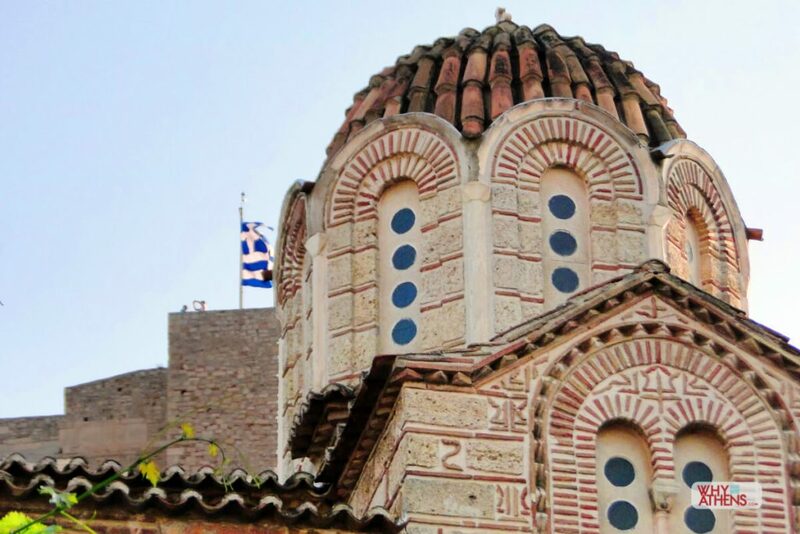 It was in the middle Byzantine period during the 11th and 12th centuries when the most significant churches were built in Athens, denoted by their small proportions, elaborate brickwork decoration and constructed in an architectural style known as cross-in-square. What truly distinguishes these churches as ‘Athenian’ are their unique red-tiled, eight-sided domes (Athenian Dome) that crown these holy buildings, representing the last traces of Byzantium in Athens. The Athenian Dome is eight-sided and symbolic of churches built in Athens during the middle Byzantine period. 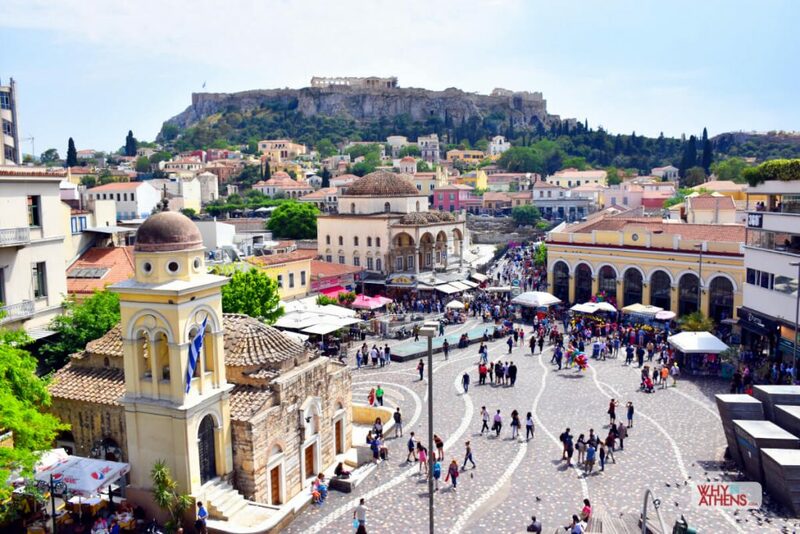 The medieval period which elevated Athens from its role as a simple provincial outpost to a town booming in construction and art, ended with the arrival of the Fourth Crusaders in 1204 and subsequent occupations until well into the 19th century. Few buildings from the Byzantine period remain, with the exception of a handful of churches built in the Athenian style. Thankfully they are still accessible today and make up an important part of the fabric of modern Athens. A short stroll around the historic centre will uncover many examples of Byzantine architecture that will captivate lovers of art and design. Here are a few of the most significant and beautiful to visit when in Athens. 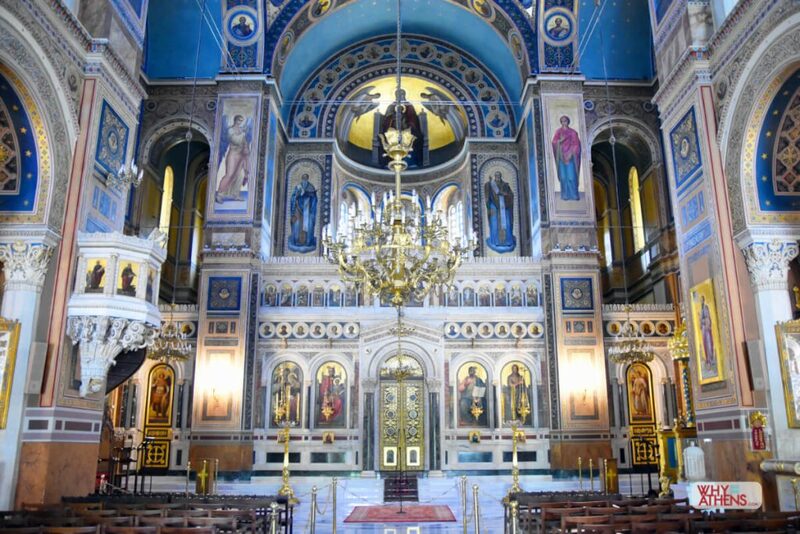 Why Athens Tip: Don’t hesitate to enter any church in Greece. All are welcome to respectfully observe, light a candle or attend a service. Most allow photography unless otherwise stated. 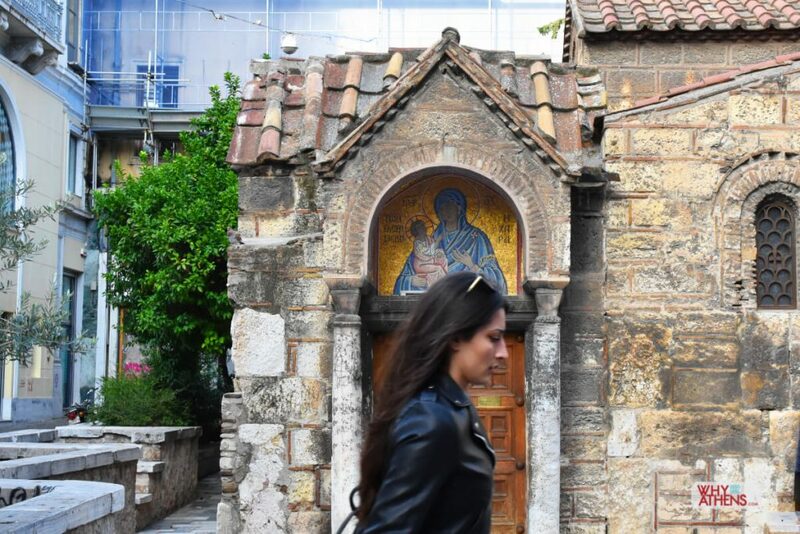 Panagia Kapnikarea, is one of the oldest churches in Athens found in the heart of Ermou Street, built around 1050AD, over the ruins of an ancient temple that honoured the goddess Athena or Dimitra. This Byzantine church is dedicated to the Annunciation of the Virgin and belongs to the University of Athens. Rare icons including the icon of Platytera or Our Lady of the Sign that depicts the Virgin Mary with Jesus Christ as a child, by one of Greece’s most celebrated hagiographers, Fotis Kontoglou. The church’s name is linked with the family name “Kapnikares” and refers to the official charged with collecting tax on tobacco during the Byzantine period. 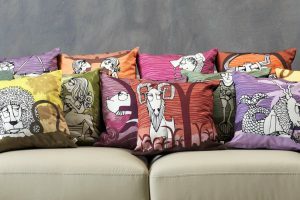 It was formerly known as “Kamoucharea” from the word “kamoucha”, which means fabrics that are interwoven with gold, referencing the many textile workshops in the area. In 1834, after Greece had regained its independence and Athens, as the new capital, was in the midst of rebuilding, town planners of the day had resolved to either demolish or relocate the church to ensure a thoroughfare for horse and carriages. The church had caught the eye of King Louis of Bavaria (father of the newly appointed King Otto of Greece) as an important landmark and together with Neophytos Metaxas, the Metropolitan Bishop of Athens, ensured the street was designed with the church in place. The church celebrates its saints name day on 15 August. Panagia Pantanassa is one of the oldest churches in Athens (circa 10th century) located in Monastiraki Square. “Monastiraki” meaning small monastery refers to its origins as a monastery which was once annexed to the Monastery of Kaisariani and used by monks during the Frankish occupation and later as a nunnery. The monastery cells were located in what we see today as the public square. Approximately 1/3 of the church is below ground level. 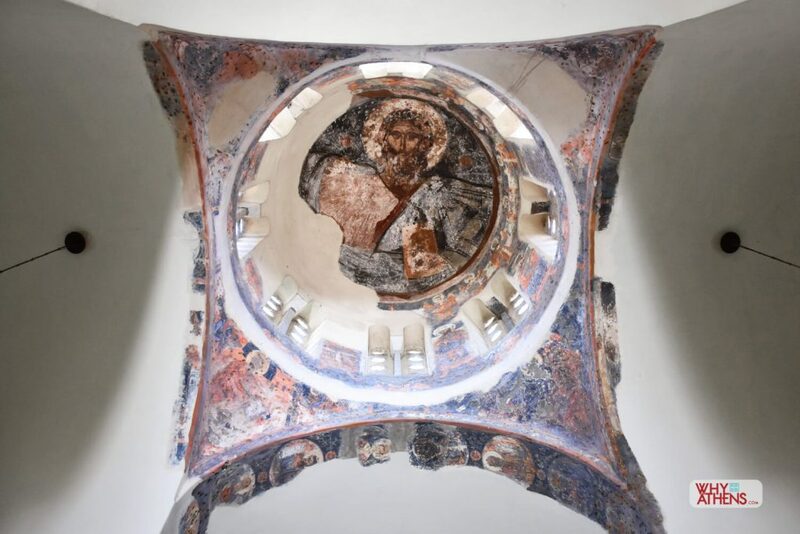 The church is a barrel-vaulted basilica denoting the transition from late antiquity to the Byzantine and Medieval World, although its bell tower along with the frescoes and iconography are more recent additions. At the foot of Philopappos Hill, lies the small 12th century Byzantine chapel of St Dimitrios, a single-aisle vaulted church that appears to be built with reused materials. The original construction is likely associated with the final phase of the Diateichisma fortification wall – a first line of defence for the city of Athens that was established in the 4th century BC. Much of the preserved frescos date to 1732, as noted in the building inscription. According to folklore, during Turkish occupation, a miracle saved this place of worship from total destruction in 1648, when the Turkish commander of the Acropolis, Yusuf, attempted to bomb the church with a large cannon ball or “loumbarda” from the Propylaea above. The next day he and his family were struck by lightning. The church therefore became known as Agios Dimitrios Loumbardiaris (the Canoneer). Significant restoration works were carried out in 1955 by the renowned 20th century Greek architect and city planner, Dimitris Pikionis whose work included the pedestrian walkways around Philopappos Hill and the two theatres, Odeon of Herodes Atticus and Theatre of Dionysos, utilising paving blocks and reused marble from neoclassical buildings around Athens. The church celebrates its saints name day on 26 October. Located in the southeast corner of the Ancient Agora, the parish was named “Solakis”, likely from the name of the family to which it belonged during Turkish occupation. 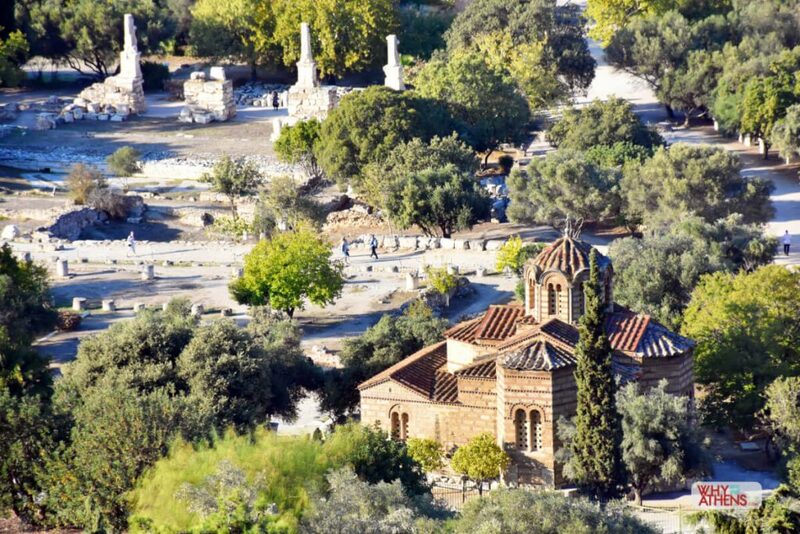 The church of the Holy Apostles was built towards the end of the 10th century partly over an ancient sanctuary and is the only medieval monument in the Ancient Agora to have survived the last few centuries of history. It is a unique architectural example of middle Byzantine architecture; a cross-in-square church with a typical Athenian dome of eight sides, supported by small columns with marble arched cornices over the windows. The outer walls of the church are decorated in Kufic script, the earliest form of the Arabic alphabet, dating from 7th century Iraq. Over the centuries, the church has been distinctly modified on four separate occasions, with wall paintings dating back to the 17th century that were revealed beneath whitewashed walls of its last incarnation. This small chapel was restored to its current Byzantine form in 1954-1956 by the American Archaeological School, which has undertaken the excavations at the site of the Ancient Agora. The church celebrates its saints name day on 30 June. 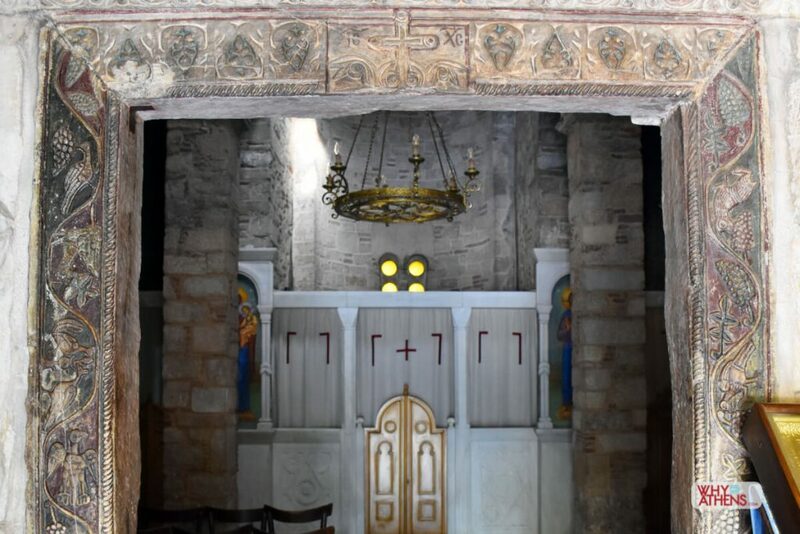 Located in Anafiotika beneath the slopes of the Acropolis, parts of the exterior of this 11th century church is decorated with Arabic calligraphy and “kufic” ornamentation. 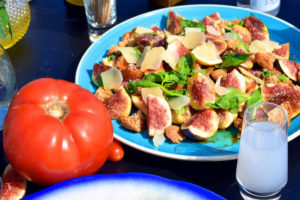 It most likely took its name from the prominent family from Constantinople whose famous member was Byzantine Emperor Michail I Ragave (811-813). The church is built over the remains of a 9th century temple of which two capitals have survived; one visible on the northeast side of the church and the other, a Corinthian capital, is seen supporting the altar. When the Ottoman forces surrendered the fortress of the Acropolis on 24 May 1833, the church of St Nicholas was the first to ring its bell. It rang again during the liberation of Athens from the German army on 12 October 1944, when the Greek flag flew once again over the Acropolis. The church celebrates its saints name day on 6th December. 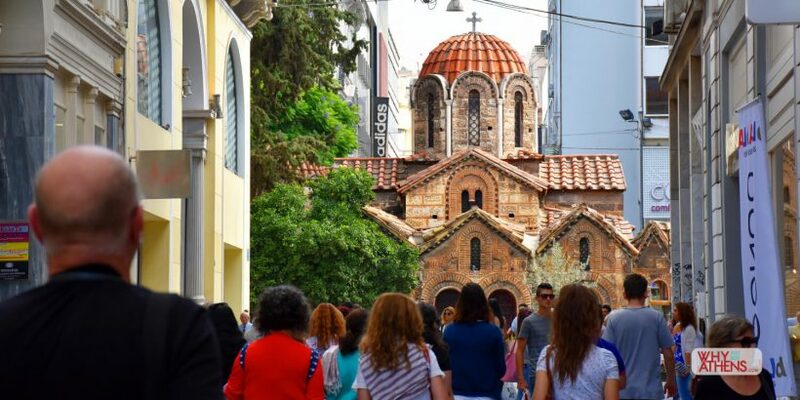 Affectionately known as Little Metropolis, this tiny church is located next to the grand Metropolitan Cathedral of Athens or “The Great Metropolis” and was originally dedicated to Panagia Gorgoepikoos, after the miraculous icon of the Virgin Mary that once laid here. 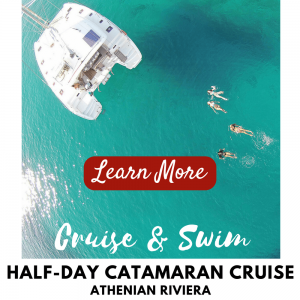 It is unclear when its construction took place exactly, but is generally attributed to the turn of the 13th century, led by the Archbishop of Athens Michael Acominatus Choniates (1180-1204). The church is built over the ruins of the ancient temple of Eileithyia that honoured the goddess of childbirth. Its current name Saint Eleftherios, is the protector of pregnant women in Greek Orthodox Christianity. Although it features a typical Byzantine layout of a cross-in-square, with an octagonal Athenian dome, it differs considerably from other Byzantine churches in Athens. Its walls are built of reused marble rather than the typical cloisonné brick system of masonry and a frieze of 90 sculptural panels wrap the façade of the building to resemble an ancient temple, although the carved crosses clearly indicate messages of Christianity. More than a church, St Eleftherios has become a monument that links the glory of ancient Athens with Byzantine Athens, something which is credited to the progressive archbishop of the time who was well versed in Ancient Greek history and who admired rather than expelled its aesthetic values and mythological themes. Its total restoration took place in 1856. The church celebrates its saints name day on the 15th December. The Metropolitan Cathedral of Athens, dedicated to the Annunciation, was unveiled in 2016 following a lengthy restoration period and is the seat for the Bishop of Athens. When the original construction took place in 1842, marble was used from 72 demolished churches around Athens to construct its walls, taking almost 20 years to complete, mainly due to funding interruptions. Since its official opening in 1862, the site remains a major landmark in Athens hosting all official religious ceremonies. The cathedral combines Greco – Byzantine styles with neoclassical elements. A three-aisle domed basilica with an interior decorated by well-known artists of the 19th century. The wall paintings are the work of painters Spyridon Giallinas and Alexander Seitz, decoration by Konstantinos Fanellis from Smyrna, while the sculptures are the work of Georgios Fytalis from Tinos. 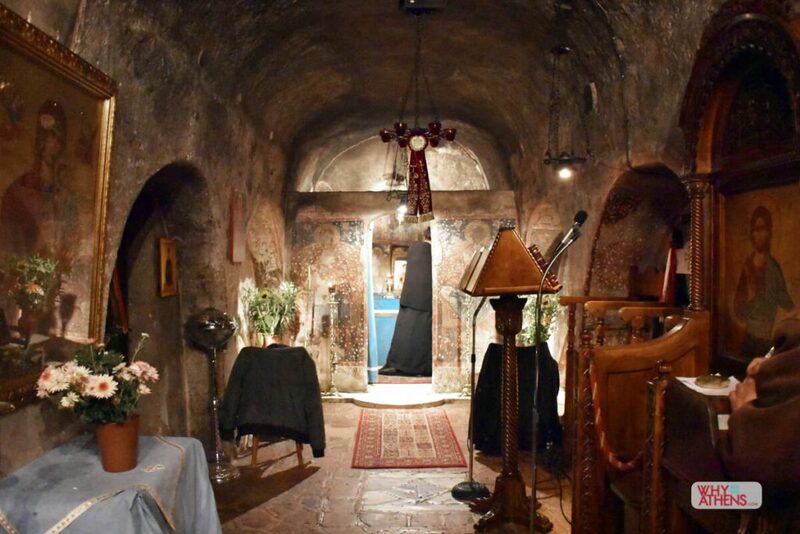 At an underground crypt inside a marble reliquary are the shrines of two martyrs, the Patriarch of Constantinople, Gregory V, and Agia (Saint) Filothei, a religious sister from Athens during Ottoman era Greece. 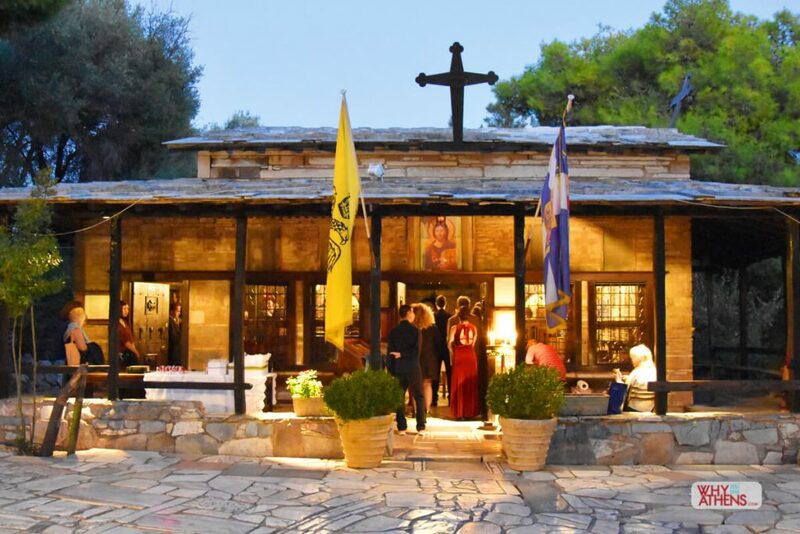 Although not from the Byzantine period, “Mitropoli” is a must visit whilst in Athens, as the spiritual centre for the Greek Orthodox faith in Greece and one of the most important holy sites in the city. The church celebrates its saints name day on 25 March. The church is dedicated to Dionysius the Areopagite, who converted to Christianity following the Areopagus Sermon given by Paul the Apostle in the 1st century AD. Dionysius was a judge of the Areopagus court and went on to become the first Bishop of Athens. A neo-baroque style cross-in-square church, St Dionysius was originally constructed in 1880 but was completely demolished in 1900 before finally constructed again in 1931 to its present form. When the Metropolitan Cathedral closed its doors in 2009 for remediation works, St Dionysius became the acting head church for Athens and hosted all the official celebrations for the city. 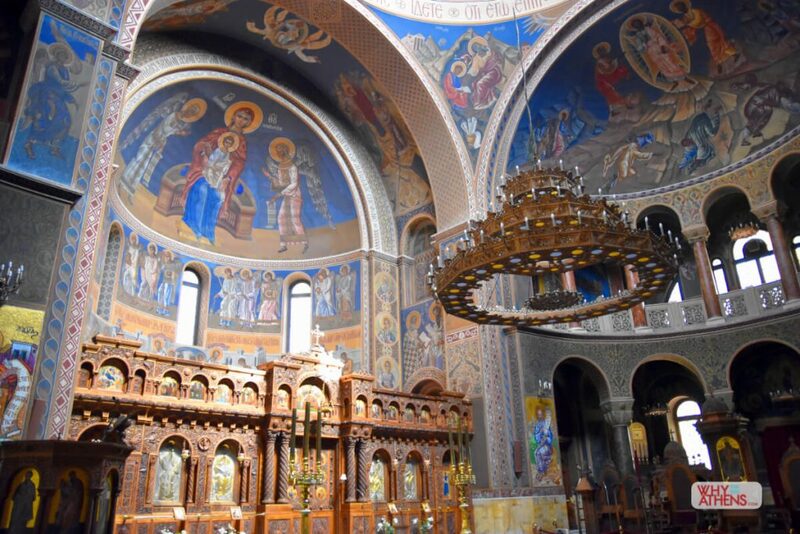 Stunning interiors, including a carved-wooden chandelier unique for churches in Greece, are complimented by beautiful frescoes, icons and mosaics in vivid blues and golds. The Templon (barrier separating the nave from the sanctuary) was exquisitely handmade by master wood-carver Theofanis Nomikos. The church celebrates its saints name day on 3 October. 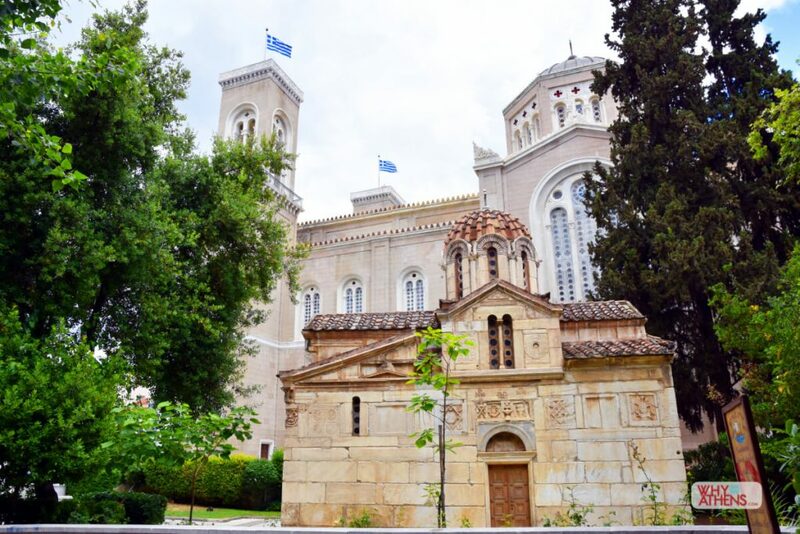 Why Athens Tip: Tens of thousands of treasures and exquisite icons from the Byzantine period are housed in the Byzantine and Christian Museum in Athens.